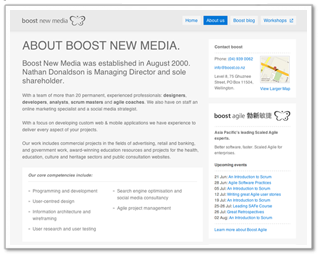 It has been a while since we last posted an update on the progress of the Boost website. There have been many additions since then, and there are a few radical changes just around the corner, so it feels like a good time to talk about where we’re at now. The sidebar on the blog was getting a little unwieldy, so we decided we needed to tidy it up. Gone were the months listed out in the archive, in came the years, with a post count beside each one. This gave us a lot more space where we could then list out the categories, again with post counts beside them. These changes may seem minor, but have made it a lot easier to navigate through our previous posts. We wanted to advertise some of our services, and chose to do so on Google and Linkedin. 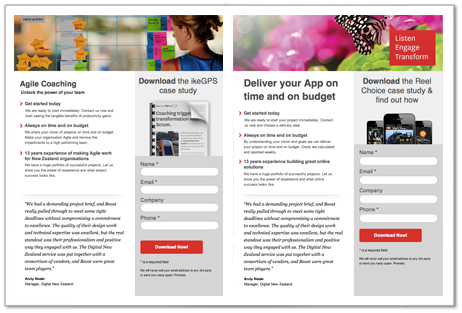 These ads were specifically about Agile Coaching and Mobile App Development, so we felt the need to have landing pages that dealt only with those services. Unbounce gave us the opportunity to get these landing pages up quickly once they were designed, and allowed us to track conversions with ease. Once a user lands on one of these pages, they need to enter their details to download the case studies we had put together, making these very meaningful leads from our perspective. 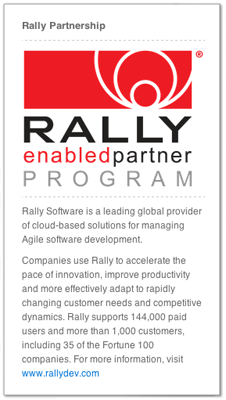 Boost has partnered with Rally, who offer Cloud-based solutions for managing the Agile development lifecycle, and we find their principles closely align with our own. You can now see their logo and a little bit of information about them in our sidebar. 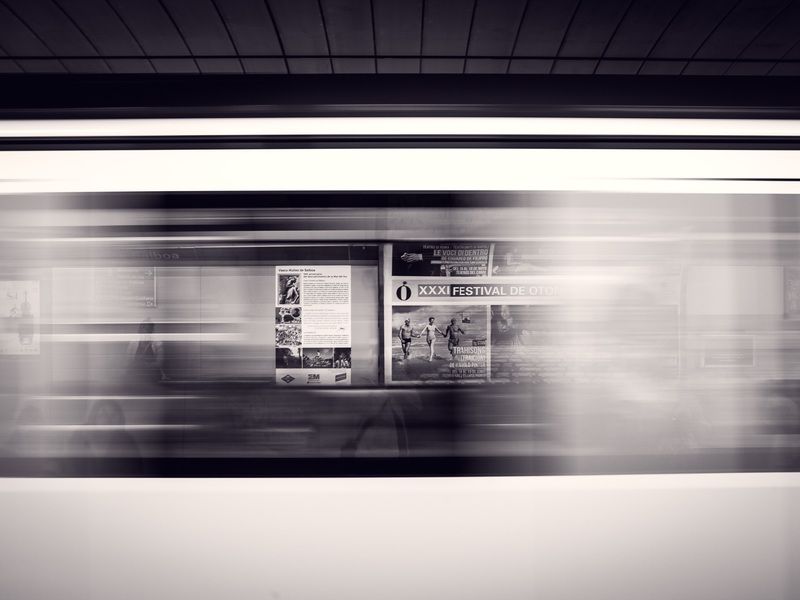 We now use the Rally software to manage most of our Agile projects, and the features it provides make it suitable for small projects all the way up to Enterprise level projects. We love having people from a variety of interesting industries come in each Friday and use our workspace (and our Wi-Fi and coffee machine). It’s always fascinating to have someone completely unrelated to Boost set up and work amongst us for a day. 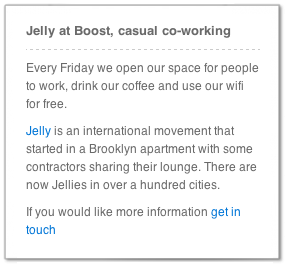 We noticed that no one had arrived for a few Fridays in a row, and realised that we needed to add Jelly back to our homepage so people were aware that it was still an open invitation. We hope to see some of you here soon. As Boost has evolved our focus has shifted from pure website development to web and mobile application development. We cut back on the homepage content and rewrote what remained to reflect this change. We removed all of our Agile Coaching content, as that now has a home at boostagile.com, and gave more prominence to Boost Agile in the sidebar so that visitors can still find it. All our workshops and courses are now listed under the Boost Agile umbrella. We finally have an about us page. With all of our homepage content devoted to our services and our work, we needed to find a place where we could give a little bit more background about ourselves and provide a more extensive list of the clients we have worked with. We like to practice what we preach, so all of our internal projects are run using Scrum, and the Boost website is no exception. We try to keep the team who work on the website as stable as we can, and they are now a close-knit and truly self-managing group. Our retrospectives have consistently brought up interesting ways to improve a variety of aspects of the project, and the enthusiasm and openness of the team have kept the momentum going. We are happy with the website in terms of content, and the next stage will be unveiled very soon. 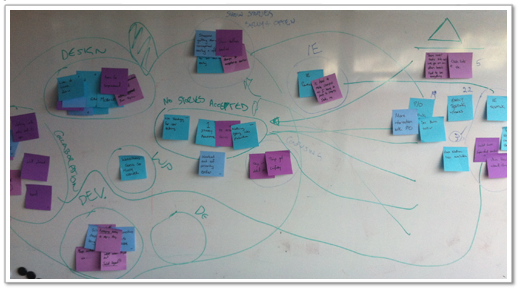 We are pretty excited about the work coming out of the current sprint and keen to let everyone else see it too. Do you need a Scrum Master?